Your lawn still needs water in autumn, even though the leaves are changing, the growing season is winding down and your grass isn't growing fast. 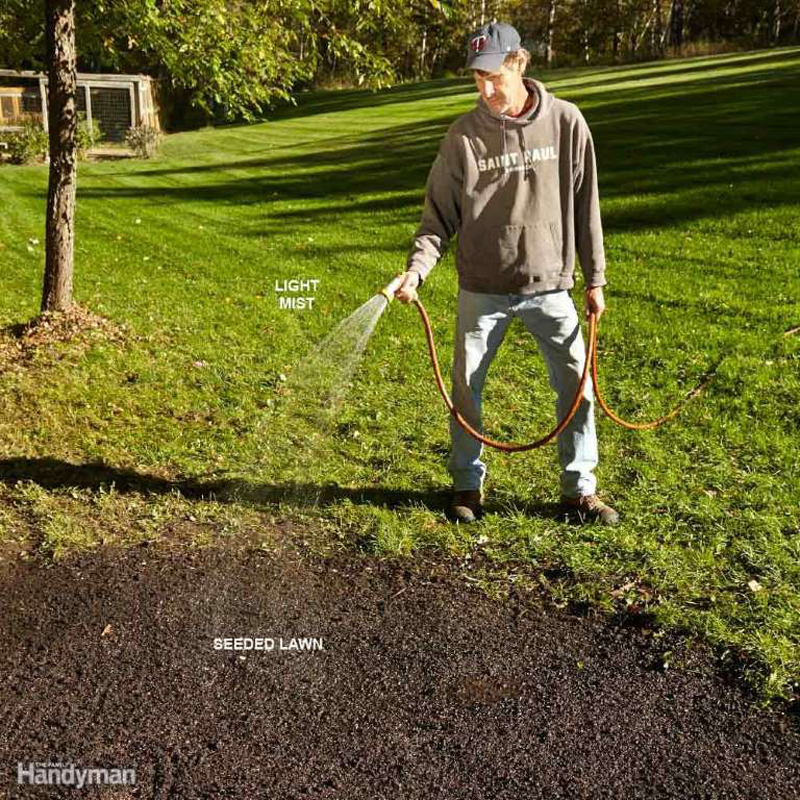 Fall watering helps your lawn recover from summer stress and gain strength for the winter ahead. Also, if you fertilize in the fall, watering is necessary for the fertilizer to dissolve and soak into the ground where it's needed. So don't put your hoses or sprinklers away until the ground starts to freeze. 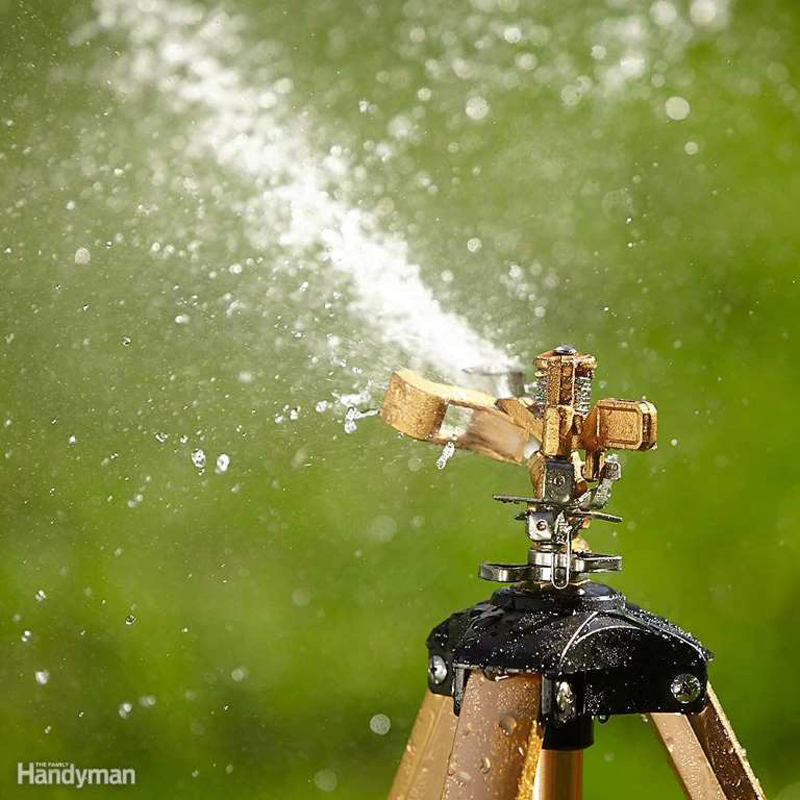 Impact sprinklers are even more versatile if you buy one that's attached to a tripod. These are great for large areas because the extra height increases the distance the sprinkler will throw water. There are other benefits too. You can easily adjust the spray pattern with less stooping, and you can direct the spray over the top of bushes and flower gardens. 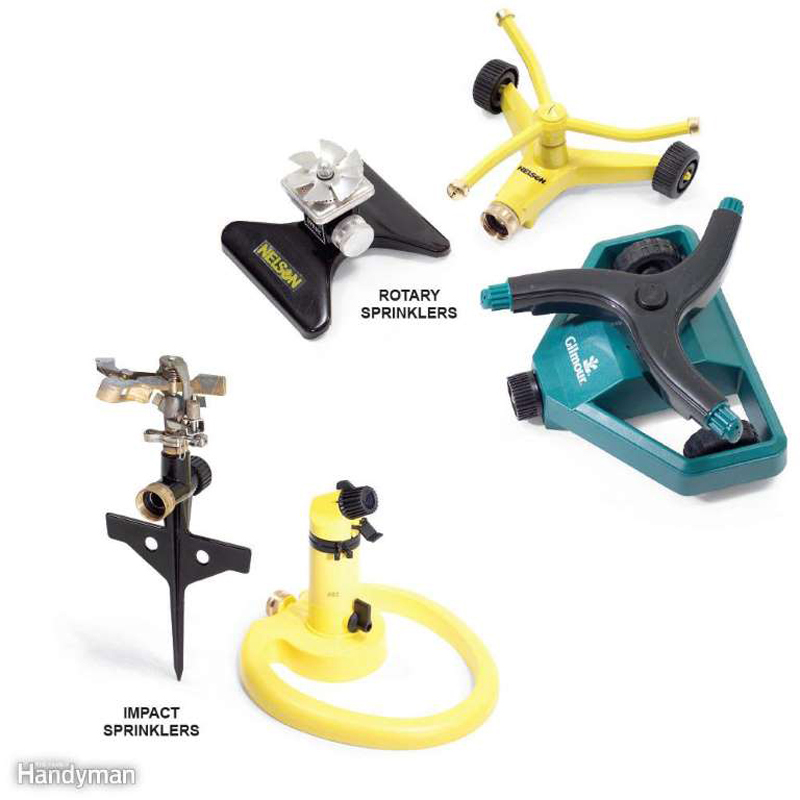 And finally, the adjustable legs allow you to level out the sprinkler on uneven ground. 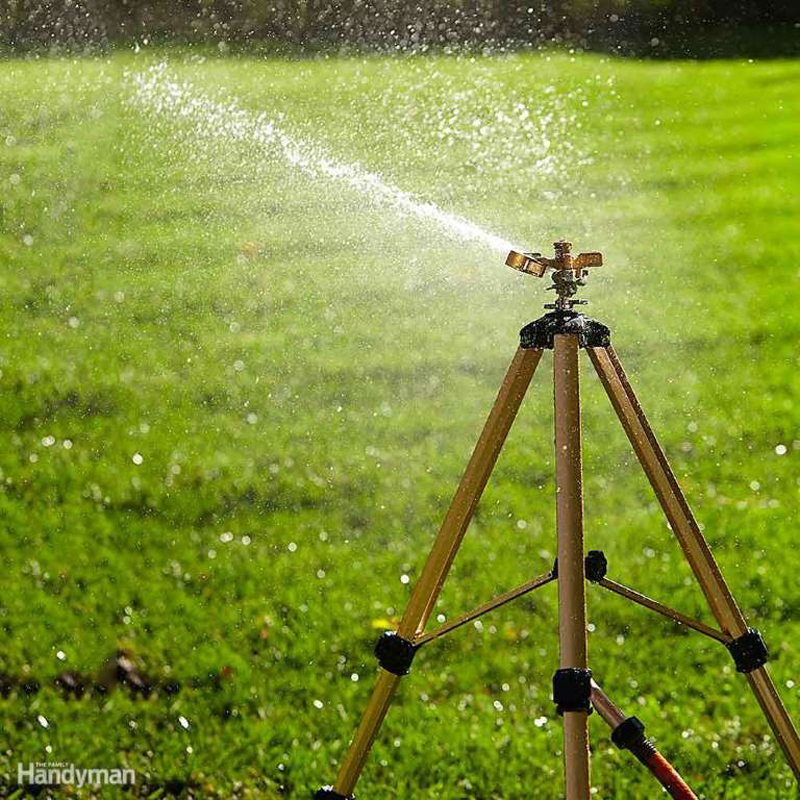 You can buy tripod impact sprinklers at home centers and garden centers. Seeding is a great way to grow a lawn or patch a bare spot. The key to success is proper watering. For seeds to germinate and grow, they must be kept constantly damp until the seedlings establish roots. Once the seeds sprout, a dry period of even a day will likely kill the new sprouts, and you'll have to start over. Seeds covered with fabric or mulch or mixed with a mulch-like product stand a better chance. But even with this protection, you should water lightly at least once or twice a day during hot or windy days. Sprinkle the seeds with a light mist until they sprout. A hard spray or big droplets of water will wash the seeds away or make them clump together. After the seeds sprout, keep watering once a day until the grass is ready for its first mowing. Constant starting and stopping will prematurely wear out your well pump. If you're using a well to provide water for your lawn, try to connect as many sprinklers as possible to maximize water flow. This will keep the well pump running continuously and increase its life span. Impact sprinklers are a great all-around choice because they're so adjustable and generally waste less water. But there may be better sprinklers for small, difficult- to-water areas. If you have just a small circular area to water, the round watering pattern of a rotary sprinkler is perfect. Long, narrow spaces like boulevards are easiest to water with flat soaker/sprinkler hoses. 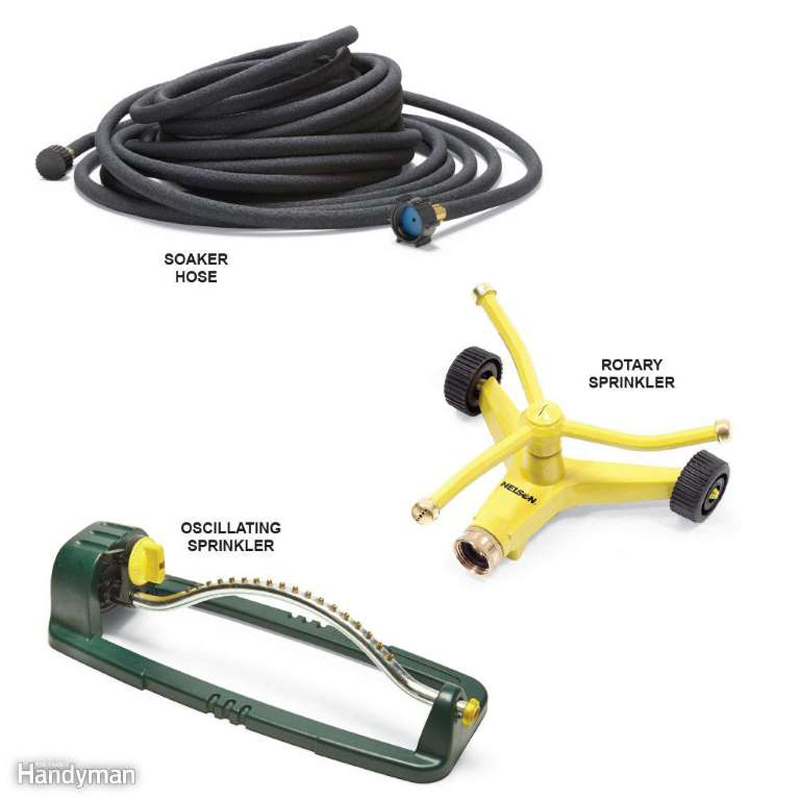 For square or rectangular areas, it's hard to beat an oscillating sprinkler. It's not the most efficient design, but the spray pattern makes it easy to water all the way into the corners. Common wisdom for establishing the correct length of time to water is to place a pie pan in the yard and note how long it takes to fill 1/2 in. deep. But experts prefer a more accurate method that takes soil conditions into account. Heavier soil doesn't absorb moisture nearly as fast as loose or sandy soil, so it needs to be watered longer. 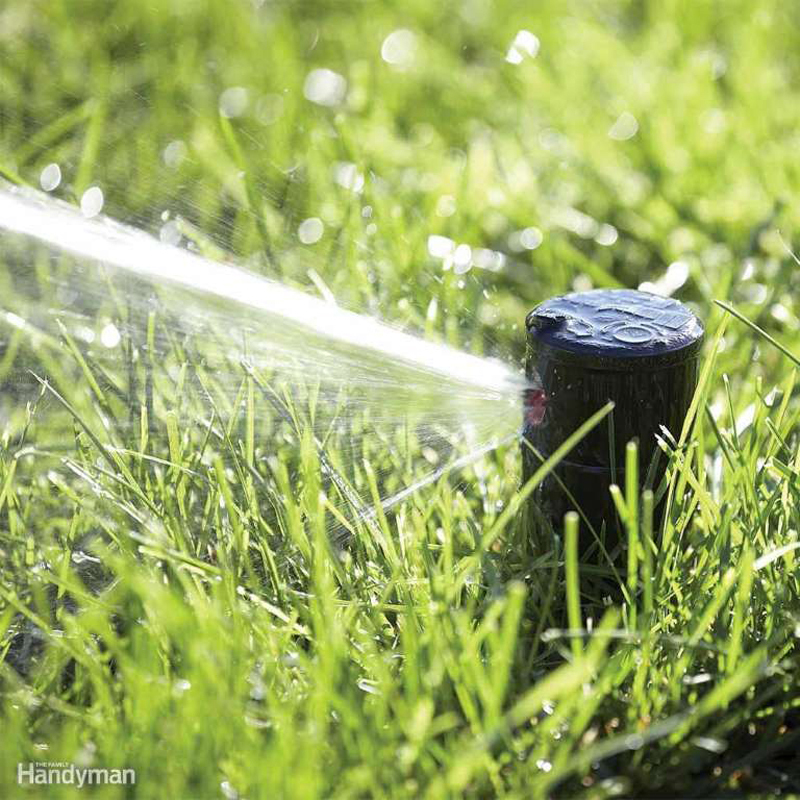 After an extended warm, dry period (dry soil is the key) set up your sprinkler and set a timer for 30 minutes. Then turn off the water and check the soil for moisture depth. 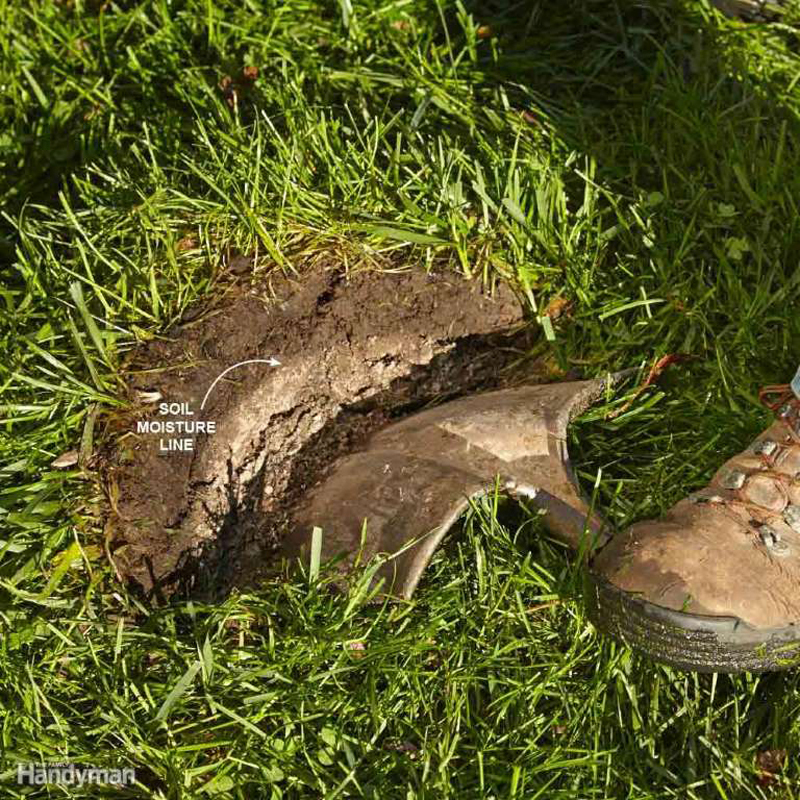 Do this by pushing a shovel into the lawn and tipping it forward to expose the soil. See how deep the water has penetrated. Moist soil will be darker. Your goal is to run the sprinkler until the water penetrates 3 to 4 in. into the soil. If the water has not penetrated far enough, restart the watering and continue to keep track of the time. Check again in another 15 minutes. With trial and error, you'll eventually arrive at the optimal length of time to water for your soil type and water pressure. If you're constantly dragging long lengths of hose from the house to the far corners of your yard, consider adding a remote faucet instead. 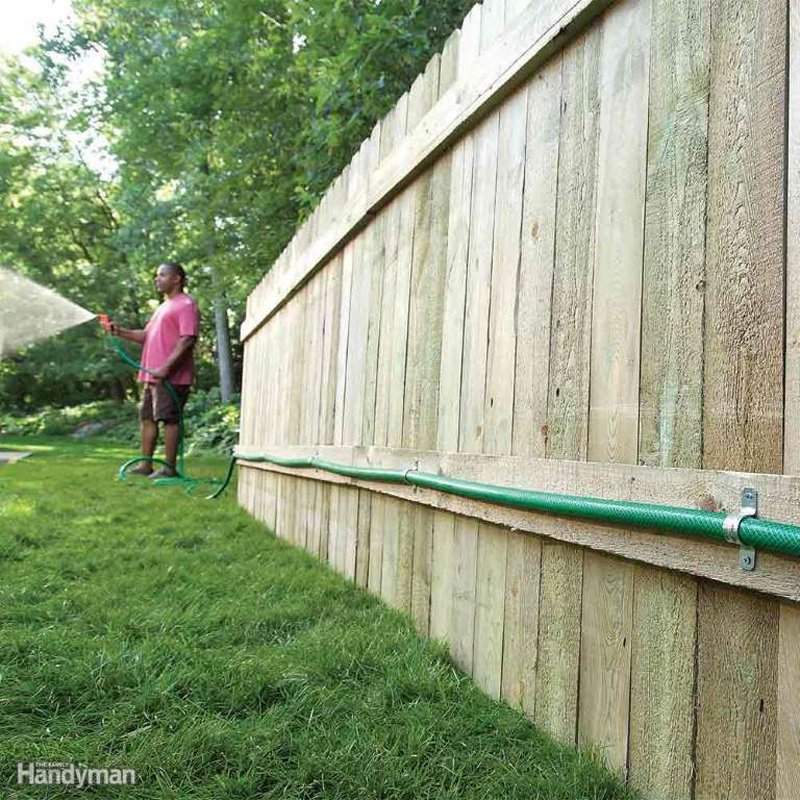 Depending on how much time and expense you want to put into it, this can be as simple as a length of garden hose connected to a fence with pipe straps, as shown here, or an underground pipe complete with a vacuum breaker at the house. 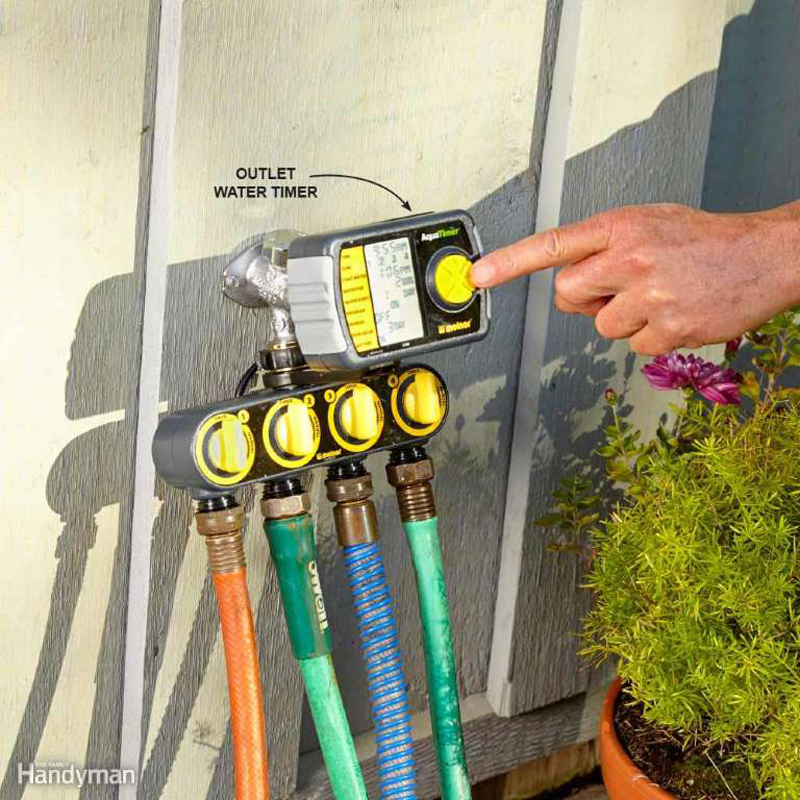 Get the convenience of an underground irrigation system at a fraction of the cost with a multi-outlet programmable water timer. Single-zone and multi-zone timers are available. Programmable timers allow you to choose the time of day and duration that the connected sprinkler will run. Read product descriptions and online reviews carefully to determine which timer is right for your situation, since different models have different functions and abilities. Keep watering in a drought. Don't believe the common wisdom that grass goes dormant in a drought. If you don't provide your grass some moisture in a drought, it will die. Water in the morning if possible. The grass can benefit from the water all day long. Plus, watering in the evening may encourage the growth of harmful fungi. Sprinklers that spray water high into the air or break up water into a mist are very inefficient, especially if you're watering when it's hot and dry. A large percentage of the water will simply evaporate before it ever reaches the grass. Impact and rotary sprinklers, on the other hand, can be adjusted to keep the water nearer the ground; the water comes out in streams or large drops that fall quickly to the ground without evaporating. 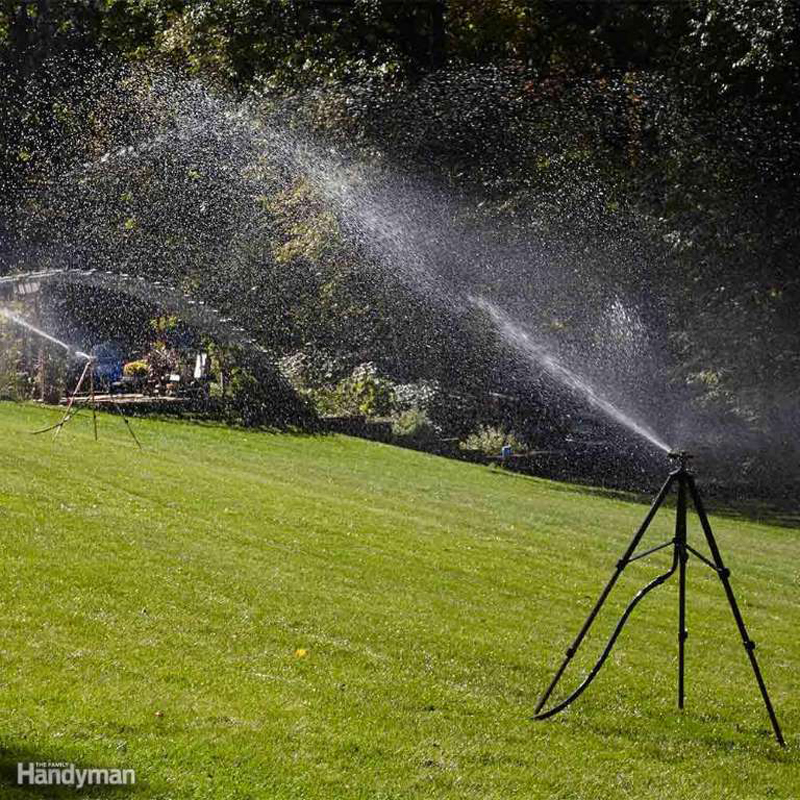 You'll save water and money using an impact or rotary sprinkler whenever possible.